Caramel Chaco Pop: Caramel popcorn covered in our milk chocolate. 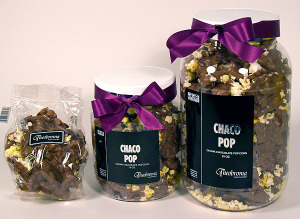 Chaco Pop: Buttery, salty popcorn covered in our milk chocolate. Chocolate Caramel Apple: An extra large Granny Smith apple with a generous layer of caramel then dipped in your choice of milk, dark or white chocolate & decorated in the opposite chocolate. Choice of nuts is available upon request for an additional price. Cortez Crunch: Milk chocolate feathered with dark chocolate, caramel, & a dark chocolate cookie crumble base, a Theobroma specialty. Dipped Pretzel: Milk, dark or white chocolate. Double Stuff Oreos: Milk or dark chocolate, drizzled with opposite chocolate. Espresso Beans: Dark chocolate covered high quality espresso beans. Handcrafted Chocolate Discs: 3 ½ in. 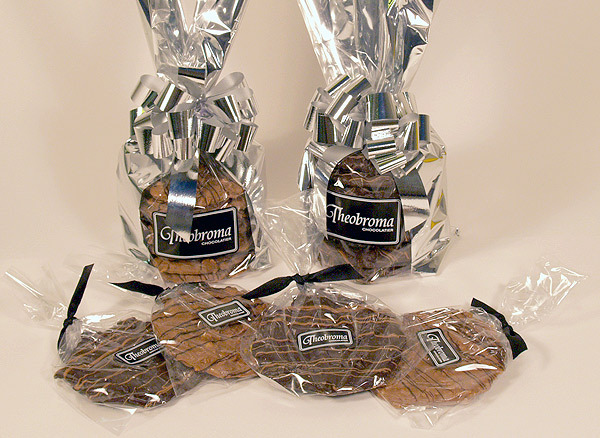 Chocolat’ Y Maiz: Milk or dark chocolate covered corn crunch, a Theobroma specialty. Pine Nut: Roasted pine nuts covered in our milk or dark chocolate. Holland Dark Chocolate Mints: Delicious mints with a light coat of chocolate and a pastel outer shell. Malt Balls: Specially made malted milk balls covered in our Swiss-style chocolate, available in milk and dark chocolate.